Welcome back to our monthly assortment of oddities from the World of Munchkin! We're back from our summer break and ready for the second half of 2016! Speaking of which . . . The Munchkin Tavern will return to Gen Con this year, back in our traditional home at Tavern on South. As in years past, we'll have announcements, cool Munchkin swag, and special dinners every night with guest hosts we aren't quiiiiiiite ready to reveal. Plus the usual assortment of Munchkin-themed menu items and promo loot! It'll be a great time and we can't wait to see all our Indy-bound Munchkin fans. Visit the Tavern web page for more information. We'll see you there! As of July 11, all of our Munchkin 2016 releases have gone to print except one that got added to the schedule right before our break. This is the result of our ongoing efforts to get further ahead of our release schedule and is thanks to the hard work of many talented members of Team Munchkin. Our work on the 2017 schedule is already well underway – far enough along, in fact, that Steve and I have started talking about our plans for 2018! Thanks to everyone who works on Munchkin for making this possible. If you want to know what's coming up, keep your eye on our New Releases page. This 15th anniversary of Munchkin has been a busy year! We've been celebrating in a number of ways, most prominently with our Guest Artist Edition series. So far this year, we've released Guest Artist Editions for Munchkin, illustrated by Ian McGinty; Star Munchkin, Munchkin Apocalypse, and Munchkin Apocalypse 2, all illustrated by Len Peralta; Munchkin Fu, illustrated by John Kovalic (!! 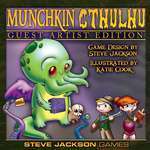 ); Munchkin Legends, illustrated by Mike Luckas; and Munchkin Cthulhu, Illustrated by Katie Cook. 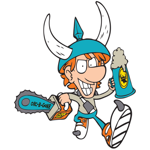 Later this year, we'll have Guest Artist Editions for Munchkin Pathfinder (Shane White) and Munchkin Zombies (Greg Hyland), plus some other cool stuff we aren't ready to announce yet. We made the Munchkin Sketch Edition available to a very limited number of retailers earlier this year, by making it part of the Munchkin Steampunk bundle and giving it away at our penthouse party at Bally's during the GAMA Trade Show. This set lets you be the illustrator for the original Munchkin game! If your Friendly Local Game Store didn't get a copy, watch us on social media – where we occasionally give away great prizes! – or look to see if we make it more widely available down the road. Another part of our Munchkin celebration are some cool new accessories: Munchkin Monster Boxes and Munchkin Playmats! With four designs of Monster Box and two Playmats, there's enough new loot for all the Munchkin fans in your house. We also made a set of Munchkin Meeples and it has already sold out at our primary warehouse, so if you like meeples or just little Munchkin toys, don't wait much longer to pick this up! Of course, it wouldn't be a celebration without some new Munchkin games and expansions. This year, we've released Munchkin Steampunk, Munchkin 6.5 – Terrible Tombs, Munchkin Hipsters (in wide release), Munchkin Puppies, and Munchkin Knights. Our partners at USAopoly released Munchkin: Marvel Edition and have two expansions on the horizon. Finally, we're halfway through the second year of the Munchkin comic book from BOOM! Studios, and the first three collected editions, covering the first 12 issues, are now on shelves wherever fine comic entertainment is sold. We couldn't be prouder of the work being done in the Munchkin comic and want to thank all the creators who have contributed scripts or art or editing to make it happen. If you haven't been reading this book, you've been missing out on some really fun Munchkin stories! Coming Next Month . . .
Gen Con! More news about 2016 and beyond! More behind-the-scenes peeks! And did I mention Gen Con? !